work and raise our children in. Pollokshields Playhouse is a new outdoor venue being built by the community for the community. Why community councils are needed and how you can join us. Pollokshields Community Council hold our monthly meeting on the first Monday of each month in Pollokshields Primary School on Albert Drive. Any resident of Pollokshields (over the age of 16) can become a community councillor and we always welcome new members. If you want to become involved please contact us. Bill is the chair of PCC. He has lived in Pollokshields for 20 years and works as an export consultant, mainly working from home, which allows him to pursue his interest in community work. Ameen lives in Pollokshields and is a pharmacist. He has been involved with many local family businesses over the years and is a well-known face in the area. What is happening in the area. Let's work together to improve our area. We would love to hear your ideas. 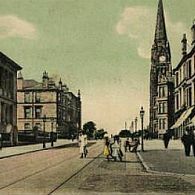 58 Glenapp Street, Pollokshields, Glasgow G41 2LG. Copyright © Pollokshields Community Council.